How to increase Domain Authority? – This question has become a topic of discussion to the Digital Marketers of the world. New online entrepreneurs or website owners are focusing on how to increase domain authority of their website? There are thousands of factors that Google uses to determine the ranking of the website on search engines. Search Engine Optimization (SEO) plays a very important role, in the search engine rankings of the website. If you ask any marketer, what is the first and foremost goal of SEO?, then, they probably will reply that it is to get No 1 position on the First page of the Search Engine Result Page (SERP). This is not a joke or dream, the whole scenario is everybody wants to rank 1 on the Search Engine Result Page(SERP), and if this happens then we can say that your CTR will increase by 200%, then the one second to you on the page. But obvious, there are lots of roadblocks in the path of really getting this spot. There is a lot about this than meets the eye. We always focus on some small but very important things. For example- ranking for certain keywords or getting authority backlinks, but, you have to think about tons of other factors as well. And one such factor is Domain Authority (DA). Before we move on our actual agenda of How to increase Domain Authority? we should know more about Domain Authority. Domain Authority is a metric which is developed by Moz. Moz is a website that predicts, how well your website will rank. It is one of the industry standards that we use when we talk about SEO and SERP. Domain Authority is measured on a scale of 1 to 100 (1 being the worst and 100 being the best), by using the algorithm, which is designed by Moz. It should be noted that if your domain authority is between 20-30, then it is much easier to improve it, than if it was at 70-80. It is also considered that Domain Authority between 40-50 is taken as average, between 50-60 is considered as good as well as 60 and above is considered as excellent. You can guess- if your DA is low, then it will result in huge loss of traffic and ranking. That is why it is important to have a good DA. But getting huge traffic and increase in DA is not something, which you can make some changes and expect your DA to skyrocket. Lots of people are facing troubles in changing their DA. Improving DA is not a thing which will happen overnight, it is somewhat a long-term process. Here we have few tips on How to increase Domain Authority? It may help you to increase your DA in few weeks. So, without wasting time, let us discuss it! Before implementing various steps to improve your DA, you should have a thorough understanding of DA. 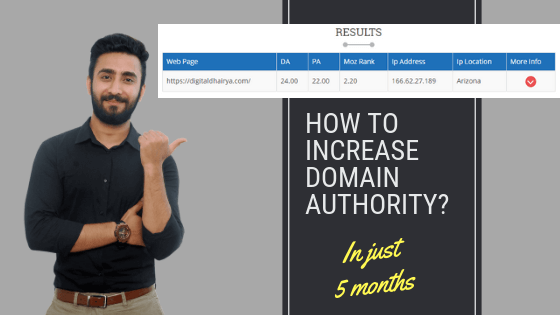 Before moving on how to increase domain authority, you should find out various factors that can affect your DA. If you don’t have any idea about your site’s DA, you need to find out your site’s DA first. 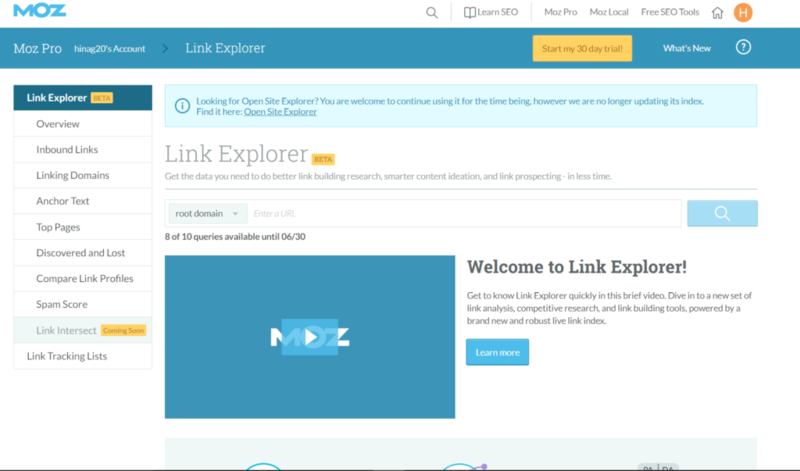 Moz, which has created DA, provides a free tool Link Explorer to check your DA. You just have to head over to analytics.moz.com/pro/link-explorer/home. You have to enter your site’s URL in the bar and click on search button. Will see the result page like this. It took Forbes many years and hundreds and thousands of links to maintain this DA, it shows that it is not an easy task. It takes years to reach that level. If you are keen on getting a great DA ranking, you have to bring your focus on maintaining a healthy link profile. You link profile is basically all of the backlinks which your site has earned till yet. A healthy link profile basically means a profile that follows Google’s guidelines. Google likes “Healthy” link profiles. No site is perfect. I bet you may be having more than a few links that fall into the category of link schemes. But, that’s Ok! But, you should try your best to remove most of them from the website, if you are keen on looking your site as an authority on Search Engines. In order to keep a check on it, you should conduct a link audit. 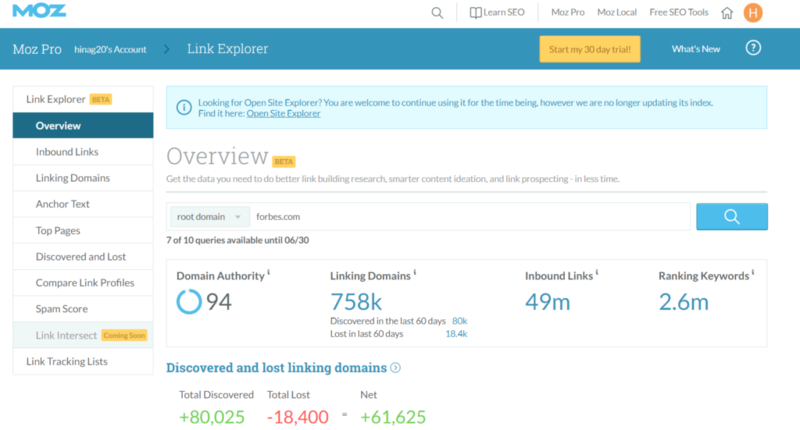 There are few tools available for link audit. Once you are done with the link audit, you have to make sure, that, there are no unwanted links on the website. There are many ways to link schemes, and we are discussing here are those only. It depends on you which option you will choose. No matter which of these methods you end up using, you have to create amazing and unambiguous content that attracts people. I am sure you have listened to the word “Content” before, surely you did! Yes, we are talking about Content Marketing and it’s an important strategy for a great link-building. If your content is absolutely amazing, then other sites which are in your niche will join(link) to your site, which in turn will increase your DA(Domain Authority) and will provide you other benefits as well. Once your content is linked, there are many ways to obtain these links. One is obviously what Brian Dean– a renowned digital marketer in the world, calls the “Moving Man Method”. This will definitely help you, and I consider it to be the best link building methods because you are really helping someone out. 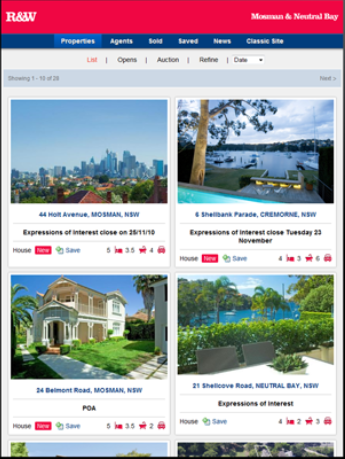 Even you are not violating any guidelines, and you can build relationships with the sites as well. Another great method is the one you all are familiar about “Quora”. 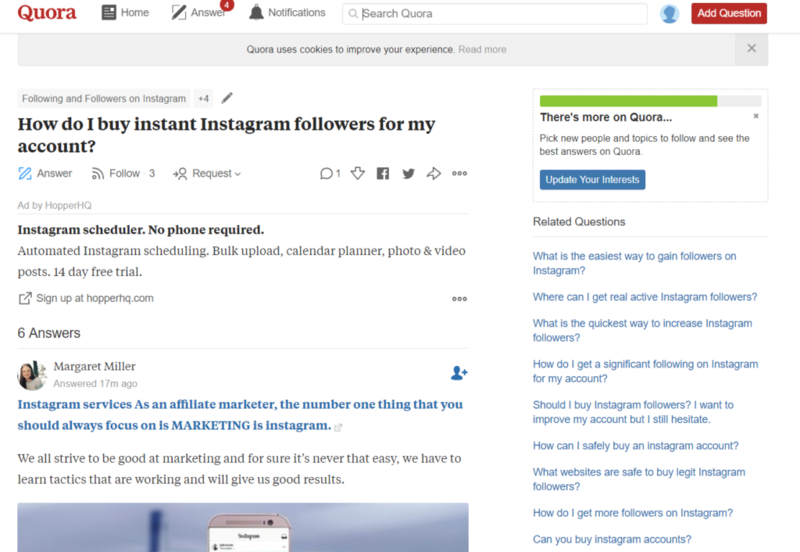 Quora can be a part of backlink strategy. We suggest Question and answer sites because you get legitimate backlinks and they are the go-to source for content marketing as well. 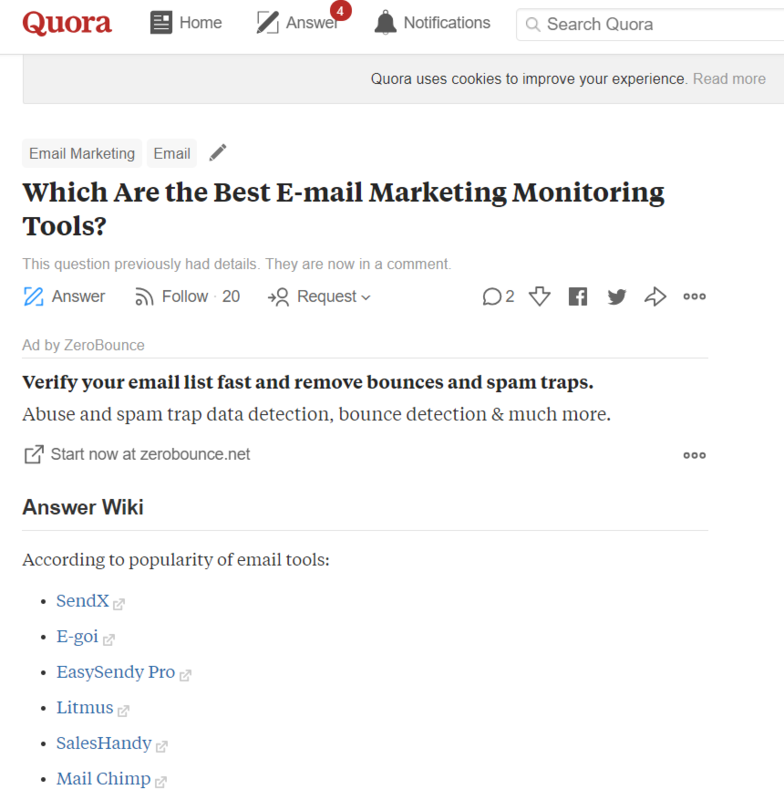 The idea behind this is, when you will search for a topic in Quora, you will get content that answers to your questions in your niche. Then you can answer any related question and link to your content. 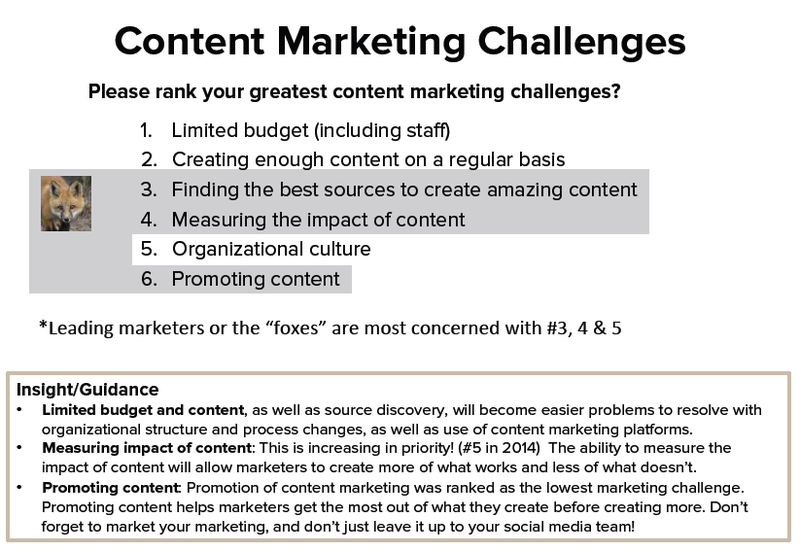 If you have content related to content marketing, you can write a helpful answer and then link your content. If you are using this method, you have to make sure that, you write an actual answer and then link it to your content. This method is somewhat like Moving Man Method. Again you are helping someone out and asking a small favor in return. There are so many sites using paid links for getting backlinks for their sites, I bet their DA score is not increasing. Getting links the right way will help your DA score to soar, but short-cuts to get backlinks, your DA score will surely dive. These methods will not work if your content is not great. Quality matters more than the length of the content. If your content is not good, no one will visit your site. And if no one visits your site, you will not be able to improve your SEO. And in return, your DA score will not improve. SEO is not just the search engines and algorithms. It relies completely on real people and individuals for traffic, social shares, and, of course, backlinks. These blogging sites provide you content that addresses concerns that their readers have. As I have mentioned earlier also, quality matters more than the length. If your reader is getting answers to the reader’s most burning questions from your content, then you will definitely get attention and therefore, your SEO will improve, which in turn will improve your DA score as well. You should go deep into your content. Your content should cover every little detail of the topic and it should be comprehensive too. 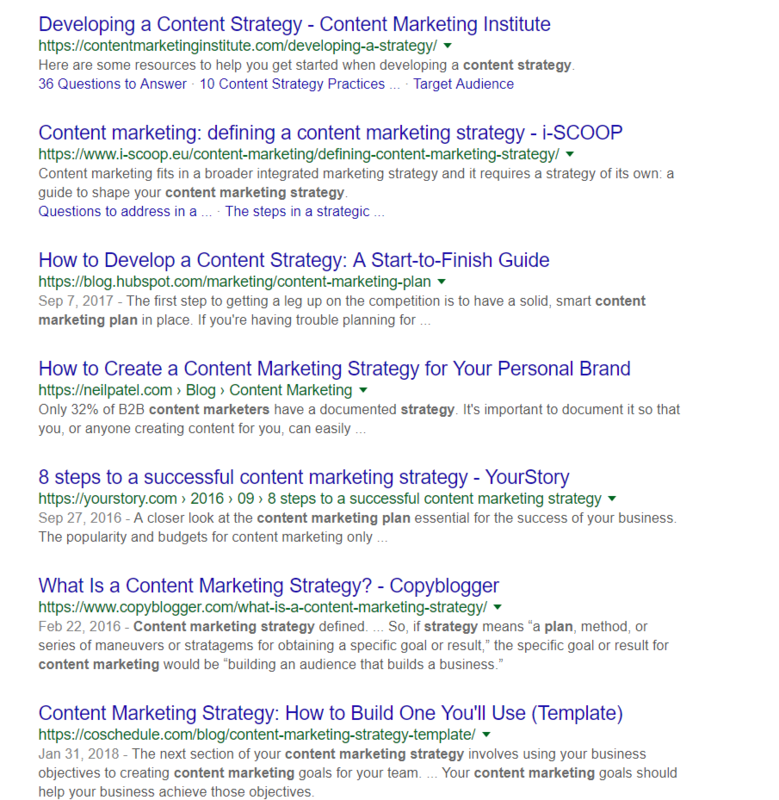 On-page SEO is a very important part of content writing. You should pay special attention to the on-page SEO of your content. Your content should be simple and make it user-friendly. 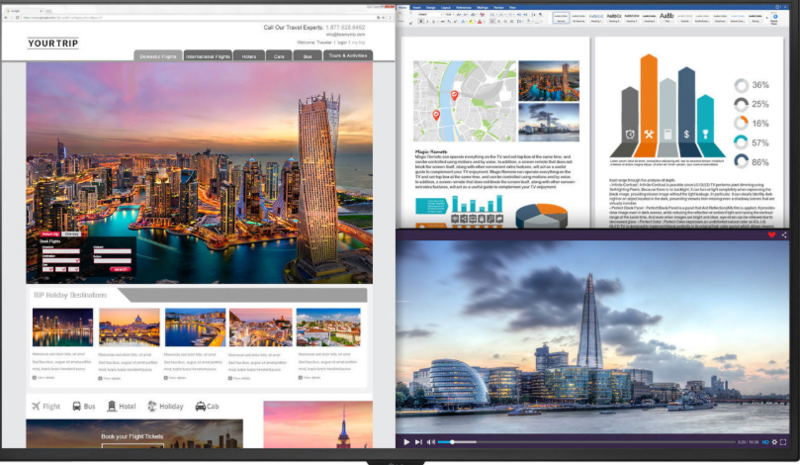 You should include media i.e., images, videos, and infographics, it will help to add visual interest and this will help break up content even more. The same way your readers react. Last but not the least on How to increase Domain Authority? is crack down on your SEO. Moz suggests that in order to improve your DA score you have improved your overall SEO techniques. SEO is considered to be the most important part of any successful site’s strategy. That means you have to focus on both On-page SEO techniques and Off-page SEO techniques(). Improving your DA should be a part of your SEO strategy like I have mentioned it earlier also. Let us discuss few aspects of SEO, that you might want to consider before we move on. Meta Tags- As we have discussed in our last articles also, Title tags and Meta descriptions are the key aspects of on-page SEO. These help the search engines to find you better and it helps your readers in finding the most relevant content on your site. When the search engines and the readers will find you easily, your DA will definitely go up. Mobile-Friendly- This has become extremely an important part of improving DA, that is with the launch of Google’s mobile’s first index, it is important now to become mobile friendly. If you have not even thought of going Mobile, you have made a mistake. Your site should be mobile friendly that is, it should go with the mobile, laptop, tablet, the smartphone as well as a desktop monitor. For one, this means that your website has a “responsive design and there are no annoying interstitials”– according to Neilpatel.com. These days when people do not have time to go with laptops everywhere, they are using more and more mobiles. If your website is mobile friendly then, your DA will improve. You should perform mobile keyword research also. Please keep in mind that you don’t have to become a dedicated SEO in order to have an amazing SEO strategy. You can combine SEO and content marketing as well. We have discussed here some of the important points of How to increase Domain Authority? I am sure and very confident, that this will definitely work for you. But you have to put your will willingly into it. There are few little steps you can opt which will give you an avenue to how to increase domain authority. Increase the loading speed of your web pages etc. If you ignore or slack off any of the parts, then it will not work for you. And as we have discussed not to automate it, because you will surely not improve your DA. But if you will follow this thoroughly, then we are sure you will be able to see a big improvement in your DA in just 2-weeks. Before the closure, I am sure you have already started thinking towards your DA and have already started implementing all the points honestly. I hope you have liked the article on How to increase Domain Authority? We will be back with some more interesting topics, with the solutions that will help you in increasing the traffic on your website. In the meantime, we request you to read the books on SEO, Buy Cheap and Best SEO Books 2018 in order to become an SEO expert. For more queries please fill the Form here. Listed here are 5 unbeatable points on How to increase domain authority of your website? Factors affecting DA, Healthy link profile, content marketing etc. Nice in-depth article. I was wondering how do you come up with such long articles in such short period of time. You also need time to Promote them and get backlinks for them too. Thankyou Dibakar Bala I read a lot and I don’t outsource any of my articles. I usually share my article on social media that’s it, all I do. Only Sharing on Social Media helps you rank on Search Engines? Yes, it will definitely help. quora are really very helpful. In starting I was sharing my blogs on Quora and this helped my blog a lot. I increased my DA from 1 to 8 in just 2 months but I noticed from last 30 days I have not published any blog post on my blog any my is not increasing, it stuck at 8.